MONET HAIR SALON - BELFAST, N.I. A new hair salon is set to open this June on the prestigious Lisburn Road in Belfast. 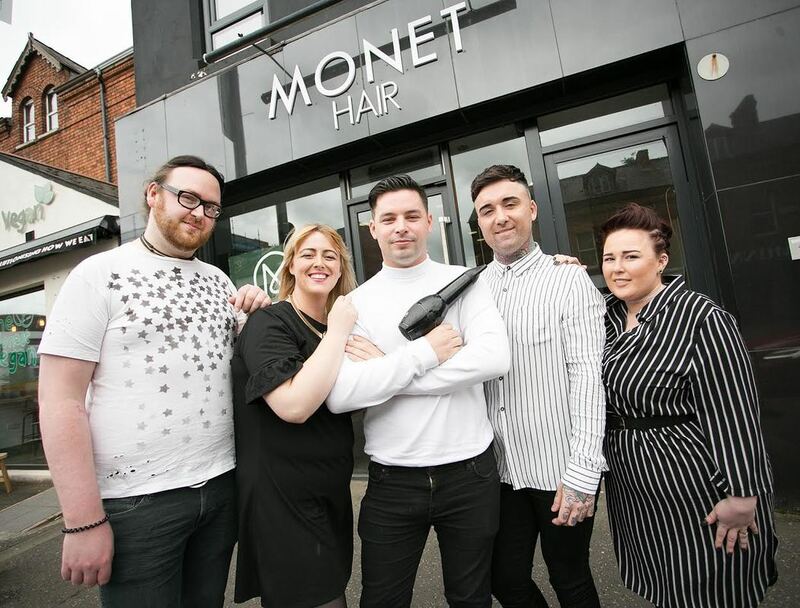 Owner, Patrick Mone decided to take the chop and launch Monet Hair after running a successful retail outlet in Dublin’s city centre for the past 3 years. Mone, who has over ten years’ experience in the industry, previously ran a chain of successful hair salons throughout Ireland before deciding to open his own business. Ensuring Monet arrives at the top of its field, Mone has added some of Northern Ireland’s leading stylists to the team with a combined experience of over 40 years in the industry. Also adding to the team is award-winning make up maestro, Paddy McGurgan who will have a concession in the salon, making Monet the perfect one-stop shop for all your beauty needs. The addition of one of Northern Ireland’s leading creative’s pays tribute to the level of expertise and talent that customers can expect when visiting Monet. David Jenkins is a senior stylist in the salon who began his career training with hair experts Toni & Guy and has since trained with colour specialists, Wella. Jenkins has spent the last fifteen years in the hairdressing industry where he has worked in a variety of top hair salons across the UK. The salon offers cuts and colour alongside specialist services such as olaplex treatments, extensions and a QOD 16 week blowdry. Favoured by celebrities, Monet will be the only salon in Belfast to offer the organic QOD blowdry – a Brazilian Keratin treatment that is 100% formdehyde free and offers 16 weeks shine, smoothness and manageability giving you salon like hair with minimum effort. In a first for Northern Ireland, customers will be able to sign up to Monet’s Blow dry Club – an exclusive, members-only club where you can access unlimited blow dry’s as well as other special discounts for a monthly fee. This innovative idea is the perfect demonstration of Mone’s unique understanding of the modern customer’s needs. Monet Hair will launch on 23rd June 2017 and will be open 10AM to 6PM Monday to Wednesday and until 9PM on Thursday. Weekend opening hours are 10AM – 6PM on Friday and 9AM-4PM on Saturday. Patrick Mone is a young entrepreneur and businessman with over ten years’ experience in the fashion, beauty and hair industries. Patrick owned a retail franchise in Dublin’s popular city centre, dealing with all aspects of running a successful business and most importantly always being a step ahead with fashion. Prior to this Patrick ran a chain of salons throughout Ireland where he first found his love for hair and beauty. His diverse marketing knowledge will bring a unique edge to the Lisburn Road. David has been hairdressing for the past fifteen years having been trained by Toni & Guy – working for them in Manchester, England, Chester, Dublin and Belfast. David is also Wella trained and a qualified barber. After Andrew finished university he joined Toni & Guy and after qualifying he worked with them for six years. Andrew loves all aspects of hair, especially colour and the vast range of methods available. He also specialises in session styling and wedding hair, including a range of up styles. Jade is a Toni & Guy trained colour technician with ten years’ experience. She specialises with Wella having completed Pure blonde specialist and Wella professional – including, advanced foiling, corrective foiling, colour on trend, quick colour solutions and creative colouring. Ashlee has nine years’ experience in hairdressing and specialises in a variety of extensions including, Angel Remy and Balmain as well as Bonds, Nano rings, micro loops and cinderellas new flip in weave. Ashlee also specialises in alopecia hair and her knowledge means she can expertly match individual hair to the correct extension. Ashlee also specialises in creative colouring and entered Creative Vision 2015 where she was one of the lucky winners. 10% off Kerastase and Label M products. £5.00 off our Kerastase Fusiodose treatment at basin. 10% off Kerastase and Label products.